It feels like it's been forever since I've posted a refashion, but I checked, and it's only been a month. I guess the rainy, dreary May made it seem longer. 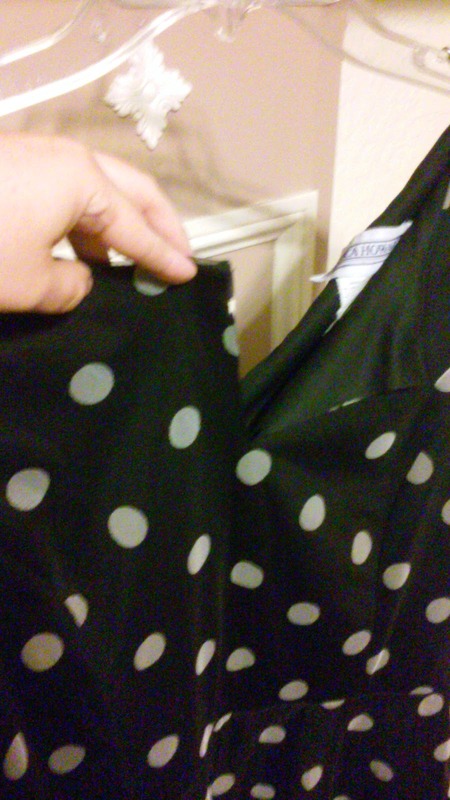 This refashion has been a long time coming. 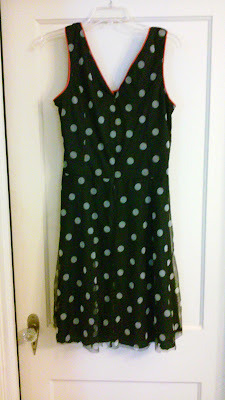 I bought this dress at a thrift store that is no longer open, over 3 years ago. It fit like a glove, and the only change I was going to make was to shorten it by about a foot, since it was that totally-unflattering-on-me ankle length that was all the rage 20 years ago. 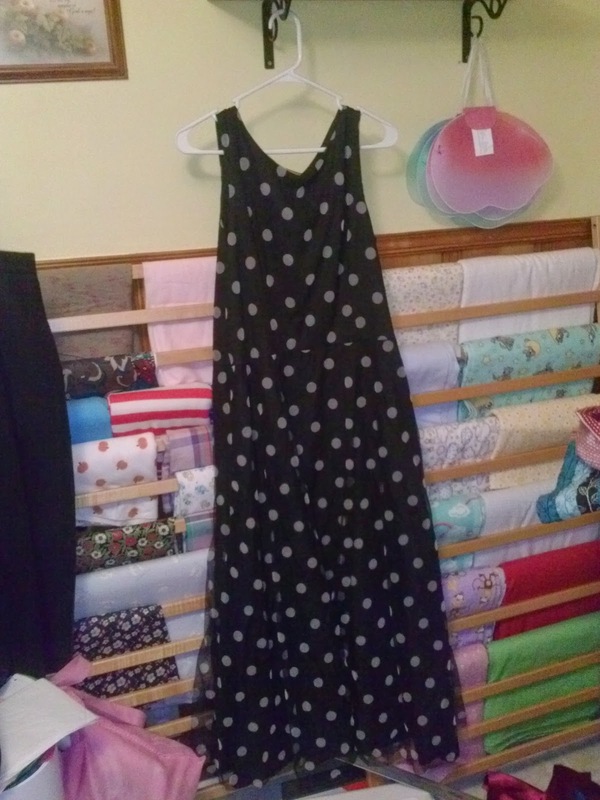 After letting the dress languish in my closet some more, I decided I needed to figure out something to do to save it, because I absolutely loved the polka dots. I gave myself the deadline of Labor Day. Fortunately, a trip to the fabric store for some quilt binding gave me the inspiration I needed! I found some cherry red piping and had my Eureka! moment. I decided to put the red piping around the neck & arm holes. After a date with my sewing scissors & sewing machine, the dress had a new knee length hem and a more flattering V neck & back. The beginning of the new neckline. 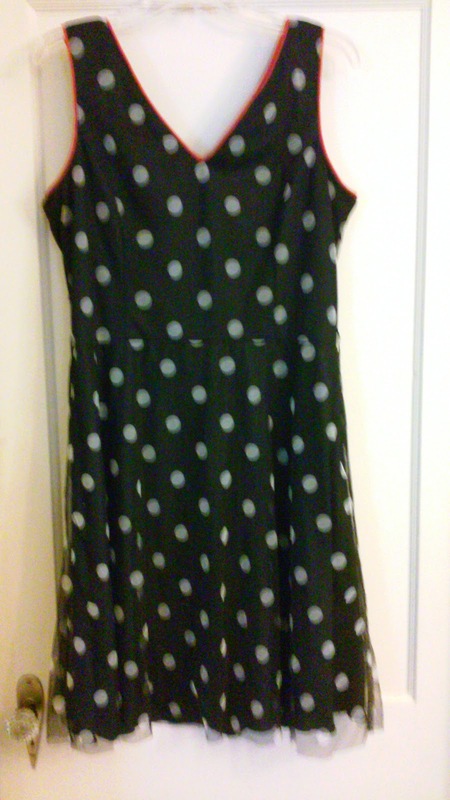 The back, which I'm actually very proud of, because I successfully shortened a zipper for the 1st time. The front! I will add a photo of me wearing the dress after I get my hands on a red belt to finish the look I'm going for. The v-neck looks great, and I like the pop of colour from the red. Excellent!! 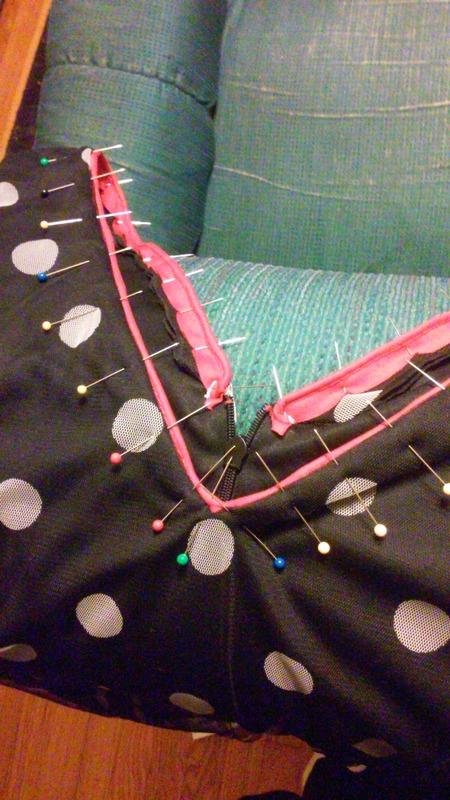 I need to keep this piping idea in mind. I think it would be applicable to many refashions. What a difference! Good luck finding the belt to go with it.